Ride the wave, Surfs up! 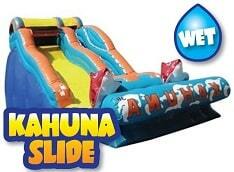 This Waterslide is perfect for any occasion! Riders scale the climbing wall, then slide down the thrilling wet slide onto the splash pad. This bright and colorful ocean theme is eye-catching and perfect for your San Diego event! Looking for the dry version of this slide? 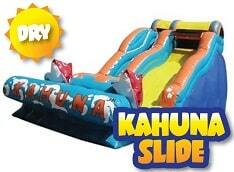 Check out our Dry Big Kahuna Slide! Minimum space: 37L x 15W x 19H.